Lowering blocks are an easy way to lower the rear of any truck. This guide will apply to GM trucks similar to the GMC Syclone (Chevy S-10, Blazer, Sonoma, and Jimmy). Lowering blocks are pretty much the go to standard for reducing the ride height of the rear of the Syclone and Typhoon. The idea is to lower the stance of the rear in order to get a more level appearance. It also helps lower the center of gravity, helping with body roll around tight bends. There are two methods to lower the back end our trucks. Lowering blocks, and lowering springs. If the money is available, the **springs are generally considered the better. However, almost all people who use blocks haven't run into any significant issues. Lowering blocks actually change where the axle sits in relation to the rear springs. It moves the axle up, brining the wheels closer to the bed, keeping the shocks at the same distance because the shock mounting plate actually stays in the same place that they would be in stock form. With the axel, the rear differential moves higher in relation to the transfer case. Theoretically, this should decrease the angle that the driveshaft has to operate at lessening wear on the driveshaft's joints. The biggest downside of lowering the trucks is the increased tendency to bottom out the suspension. With less travel between the bumpstop and the axel, you may notice more hard jolts over rough pavement or when carrying larger loads. Make sure you use your wheel chalks on the front wheels, and jack up the rear suspension by placing the jack perch on the flat bottom area of the rear differential. Position the jack so that it rolls in directly from the rear of the truck. This will give you plenty of room on both sides. 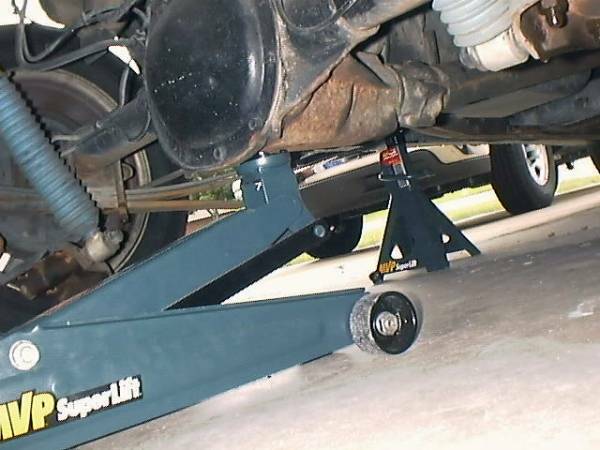 Insert your jack stands on both sides of the truck's frame. 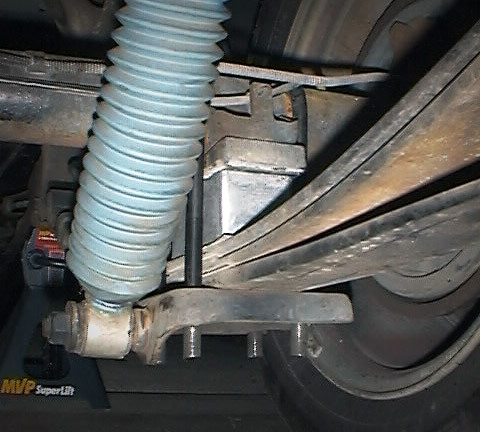 Place them just forward of the rear leaf springs. 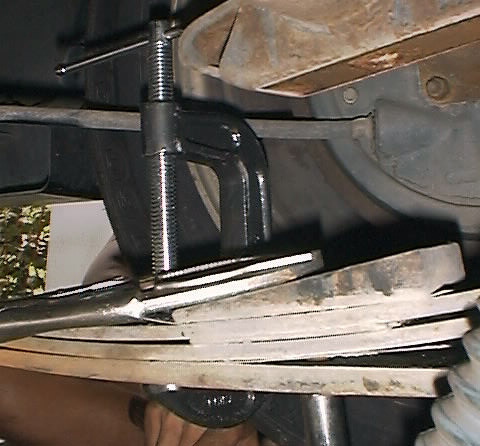 Each set of leaf springs is attached to the rear axle by a pari of U-bolts. The old U-Bolts will not be re-used so you can cut them off if required. However you should be able to prep them with a little penetrating lubricant and twist them off with a long breaker bar or impact wrench. 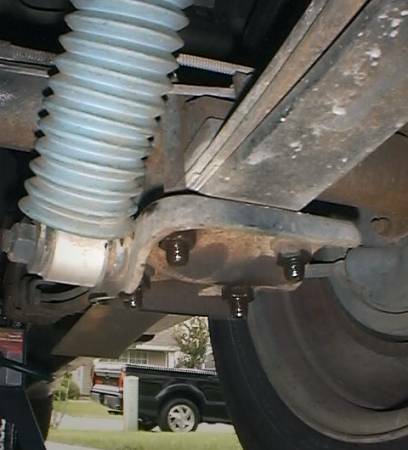 The shocks can remain bolted to the lower sandwich plate, just swing them out of the way once the u-bolts are removed. Remove the U-bolts on the opposite side of the axel as well. The rear axle is now free to move around, be careful as you reposition it. 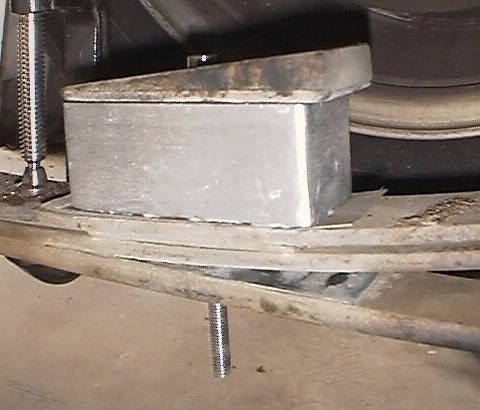 There is a wedge bolted to the top of the leaf springs. This wedge is important for the angle of the drivetrain components. We will need to remove it for now, so that the lowering blocks can sit between the wedge and the springs. Start by placing your in front of the wedge, clamping the spring pack together so that it doesn't move around once we remove the center bolt. You'll now notice that the bolt has a round head on the top. Using a set of locking vice grips on the round head allowed us to remove the nut on the bottom. Spray with lubricant if needed. Most lowering kits blocks have a solid center, since we plan on bolting our spring perch through the blocks, we'll need to drill out the centers of each block. If the lowering blocks have a protruding "dimple" at the top, grind it flat. This is where the head of our 6" bolt will sit when complete. Using a drill bit just large enough to fit our 6" bolts through, drill the centers out of the blocks. The 6" long bolts will be installed down through the wedge, block, and springs. The nut will be screwed on from the bottom. For this to work, we will have to round the heads of the bolts just like the ones we removed. Grind the heads of the bolts round so that they will fit into the recess on the bottom of the axel perches where they contact the wedges. Top to bottom, the spring pack will now be: Wedge (thickest part to the rear), Lowering Block, thin metal shim, leaf springs. 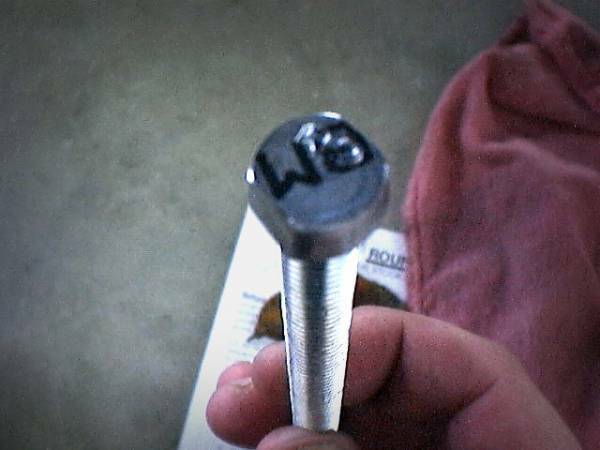 Insert your round head 6" bolt down through the assembly, adding a washer, lock washer, and nut to the bottom. Tighten the nut most of the way and remove the c-clamp just before its too tight to remove. 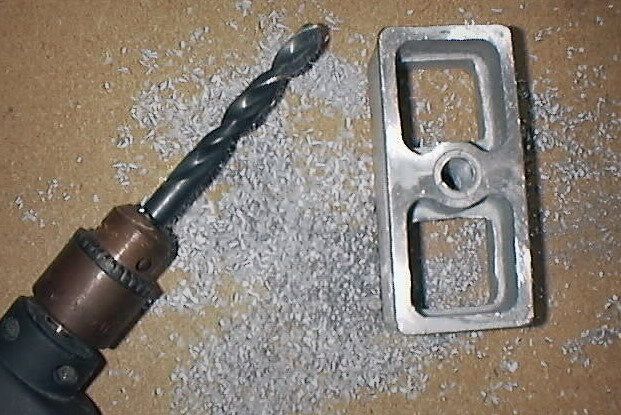 Using a cut-off wheel or grinder, remove the extra length of the bolt protruding from the bottom of the spring pack. It will need to fit inside the shock plate, so remove most what is left. Insert the new U-bolts over the axel and through the shock plate. 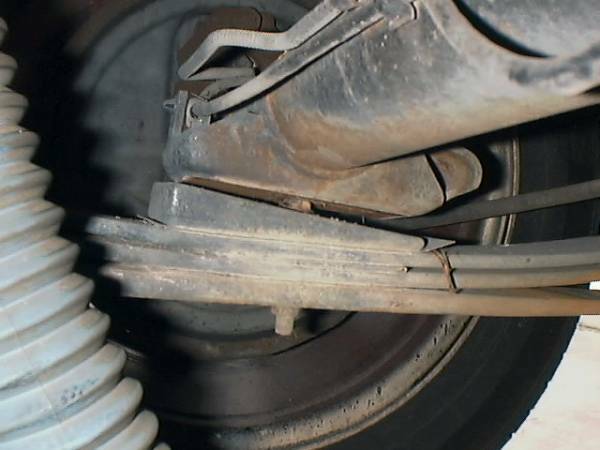 Be careful not to place them over any brake lines. Install and tighten the 4 nuts on the ends of the U-Bolts. The kit we used suggested 90-100 lb.-ft. This is probably the most tedious step. The new U-Bolts are generally way too long and theres lots of wrench turning to do. You'll benefit from a impact gun here. This is an optional step, but you may be left with a lot of U-Bolt sticking down past the shock plate. If they annoy you, trim them using a grinder or cut-off wheel. The instructions that came with our kit suggested you re-torque the bolts after 100 miles. I broke a lowering block in my Typhoon way back when. You can run a shorter bump stop, but it does actually help protect some things. I guess I have to look under a truck again. Been a few years.